Niche technology consultancy firm, Nukon, along with IT, consulting, and business process outsourcing company, Cognizant and Toshiba Electronic Engineering have been named winners at TIBCO’s 2017 Asia-Pacific partner awards. At the awards ceremony, which was part of TIBCO’s NOW Conference in Singapore, Nukon was recognised with the Business Innovation Excellence Award. According to TIBCO, the company won the award for bringing together expertise from optimisation and automation, to transform data into actionable whole-of-business insights: from the supply chain to operations, the shop floor, IT, engineering, and the enterprise system—fully integrated, pan-business optimisation. “Nukon helps clients understand and implement their strategic vision, to deliver innovative and awesome projects,” TIBCO CEO, Murray Rode, said. 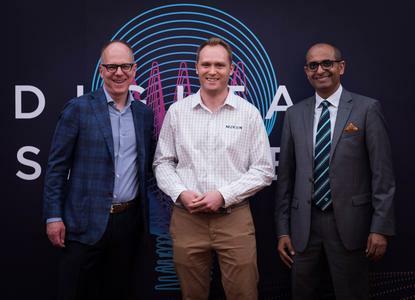 Most recently, Nukon, was engaged by Melbourne Airport to implement a hybrid operational technology (OT) and information technology (IT) solution featuring the TIBCO Fast Data technology stack. Nukon was taken on by the airport to help integrate its siloed systems and combine data from multiple IT and OT sources to provide an intuitive, real-time representation of its current operational situation. Cognizant was recognised with the TIBCO Global Partner of the Year Award. TIBCO’s global consulting partner and the recipient of TIBCO’s Partner Excellence Awards in 2013, 2014, and 2016, the company said Cognizant has been leading the front of digital transformation and innovation involving TIBCO and has compiled more than 450 customer success stories over the past five years. Cognizant currently partners with 100 active TIBCO customers across the globe to drive digital transformation and enable digital experiences across sectors of banking, insurance, retail, consumer goods, life sciences, healthcare, telecom, manufacturing and logistics, travel, and hospitality. Cognizant recently opened a Digital Business Collaboratory in Melbourne in February, with over 100 jobs expected to follow within the next three years. The company also acquired Sydney-based IT services provider, Adaptra, in December last year. In addition, Toshiba Electronic Engineering Corporation, an affiliate of Toshiba Corporation, went home with the TIBCO Analytics Partner of the Year Award. A TIBCO Analytics Partner since 2010, Toshiba Electronic Engineering Corporation partners with its clients to “seize new business opportunities” and explore data to develop actionable insights with TIBCO Spotfire Analytics. "TIBCO’s partner ecosystem in the Asia-Pacific region provides essential expertise to help our customers realise the benefits of a smarter digital strategy," Rode said. “We congratulate Cognizant, Toshiba Electronic Engineering Corporation, and Nukon for their commitment and investment in TIBCO, and the value they continue to create for our customers in Asia and Australia,” he said.